Though they weren't given anywhere to go Imber's villagers were 'liberated' of their homes in 1943, with just 47 days notice, to make way for American troops to train for the liberation of Europe during World War II. With foresight the Ministry of Defence, as it is now called, had before the war bought up the farms, and even the village itself, to make Salisbury Plain the largest military training ground in the UK. So the villagers were 'just' tenants, therefore were easily made to go, though, as they understood it, only until the war ended,. They were never allowed back. There is believed to have been a settlement at Imber since 967AD. The Doomsday Book, completed in 1086, records there being 7 households, comprising: 1 villager; 4 smallholders; and 2 slaves, estimated by some as totalling 50 persons, though it may have been less. According to the Doomsday Book more than 10% of England's population were slaves, some of the trade operating out of nearby Bristol, though at that time slaves were exported - English men women, and children, some to Ireland. It isn't known who the slaves were in Imber, they may have been children sold by their parents into slavery rather than see the whole family starve. These were rough times when the disparity between rich and poor was even more evident than today, and when poor really meant poor. 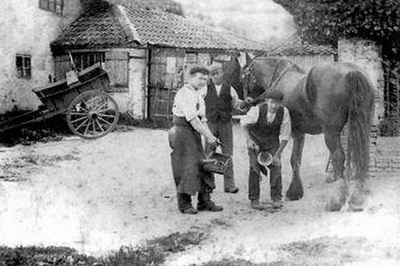 A maid in Imber in 1892, working at one of the farms, is recorded as earning just £4, plus her keep. 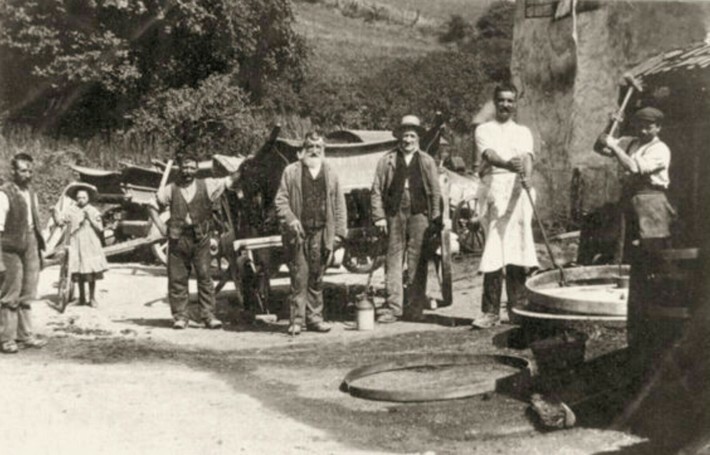 By the 14th Century the population had risen to around 250, peaking, according to census, in 1851, with 440, though by the 1931 Census this had fallen to just 152. 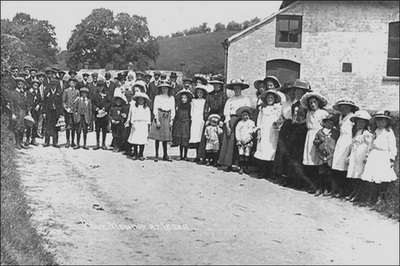 Of 28 villagers serving in World War I three were killed. Continue on down to read about Imber's eviction in 1943, as well as the 'friendly' firepower demonstration that killed 25 people and wounded 71. This website is constantly being added to, if you have any information that you think should be added, corrections made, or can supply photos please do he editor. 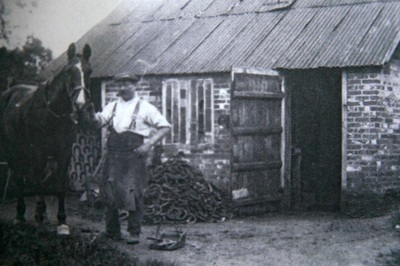 The smithy was near the council houses, within where the urban warfare buildings are. Fixing a wheel for the cart. Blacksmith Albert Nash was reported to have been seen weeping over his anvil when the villagers were evacuated. 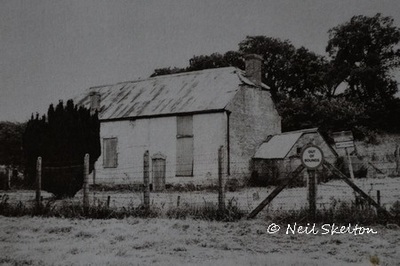 The Baptist Chapel, before it was demolished in the 1970s. 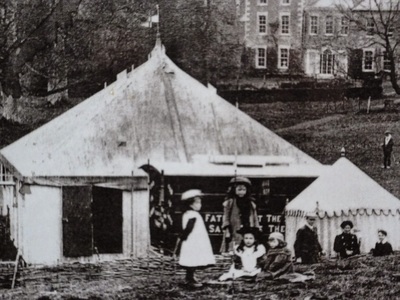 A visiting preacher's tent photographed in 1909, with Imber Court in the background. The church in this Pathe news item is not the one at Imber, it's St Mary's Church at Steeple Ashton, maybe they forgot to film Imber's and thought that nobody would realise! Arising out of the decision that increased training facilities are to be made available in the Imber area, I regret to inform you that it is necessary to evacuate the major part of the Department's Imber Estate, including your dwelling. To this end I enclose you formal notice to quit. The area has to be evacuated and made available for training by Dec 17th. In this connection you will note that the formal notice to quit expires on and it is confirmed that there will be no objection, if it assists you, to your remaining in your dwelling as tenant on sufferance until a date not later than Dec 17th 1943. It is appreciated that apart from the distress the move will cause you, it must inevitably occasion direct expense for which you have no legal redress against the Department. It is however, desired to assist you in this direction as far as is practicable and equitable, and I am directed to state that the Department is prepared in principle but without prejudice to refund to you reasonable expenses incurred by you in respect of the removal of your furniture to your new home, and the travelling expenses thereto of yourself and members of your family at present living with you. In addition, if you are so unfortunate as not to be able to find alternative accommodation, and it is necessary to remove your furniture to store, the Department will refund the cost of removal to store and reasonable storage charges until you can find another house, or until the Imber area is again open for occupation, whichever is the earlier. Further the Department is prepared if you so desire to take over from you by valuation, any produce in your garden which you are unable to harvest and take with you, and I shall be glad if you will let me have as soon as possible any claim you wish to make under this head. 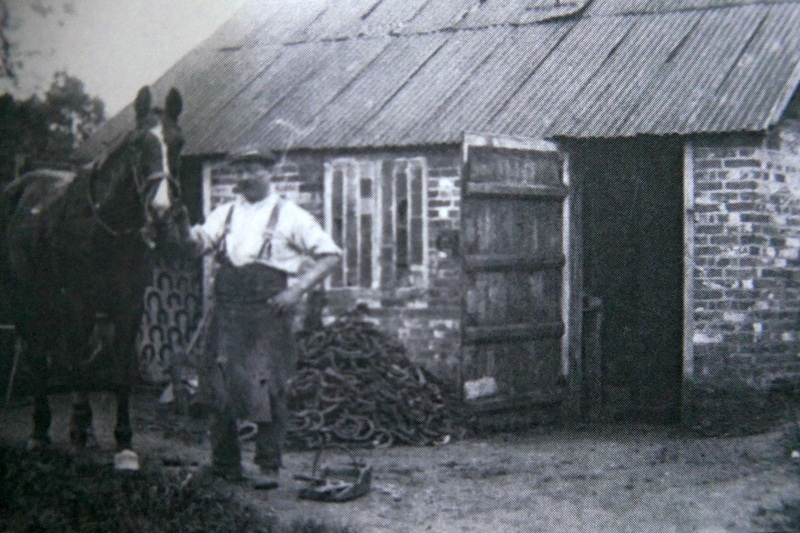 The blacksmith, Albert Nash, is said to have died of a broken heart.. “When the time came to evacuate the village they found him slumped over his anvil, crying like a child,” a local historian recalled. “Within a month he was dead.”, he is buried at the village church. Villagers protested against the evacuation, obviously to no avail, and even on 22 January 1961 approximately 2000 protesters breached security to get to the village seeking its return to the community, concessions since then have enabled access for a few days each year. Evidence appeared at the Defence Land Committee hearings in the 70s that there had been an agreement that tenants would be allowed to return after the war, but by then, at least, the army had found Imber too useful for urban warfare training, including for Northern Ireland, and the danger to any resident from ordnance used in training on Salisbury Plain in general was considered too great (all such activity is stopped during open days!). Most recently Imber has been used for training soldiers ahead of their deployment to Iraq and Afghanistan. Despite the already larger urban warfare training facility at nearby Copehill Down receiving a £500,000 upgrade in 2015 it seems unlikely that Imber will be released for habitation once again (the 70s tactical buildings, that most of the historical village was demolished to make way for, lack a certain charm anyway!). Imber had been a community dependent upon agriculture. Those who were not directly employed on the land were in trades dependent upon it. The decline in population is shown in the census of Imber which shows a peak of 440 residents in 1851 and just 152 in 1931. A little known friendly fire incident took place on the 13 April 1942 at Imber during World War II. A RAF Hawker Hurricane taking part in a firepower demonstration in training for one to be attended by Winston Churchill accidentally opened fire on a crowd of spectators, killing 25 and wounding 71. Pilot error and bad weather were blamed for the incident, the pilot himself was shot down over France just a few months later. Land was first purchased for military training on Salisbury Plain in 1897. Within 5 years the total area in the hands of the War Department had risen to 43,000 acres (17,400 hectares). Permanent barracks were started at Tidworth in 1905. After the First World War, the War Department resumed buying land on Salisbury Plain and spread westward across the Devizes to Tilshead road. The Larkhill Royal School of Artillery was built in 1920. 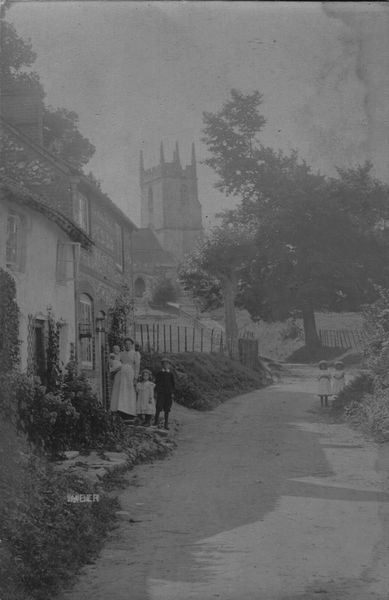 The village of Imber and its surrounding terrain were acquired over the period from 1928 to 1932, although the villagers became tenants of the War Department and were not actually evacuated until 1943, during the Second World War. ImberVillage.co.uk does not manage the village and advises visitors to adhere to all safety advice when there.